Teenagers will be offered the opportunity to train to work in the RAF at a pioneering college to be opened in September. 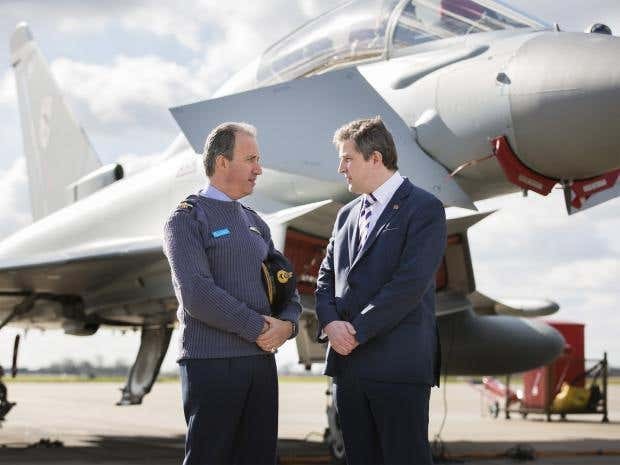 The Air and Defence Career College in Lincoln will be the first of its kind – at first offering 16 to 18-years the chance to train for a range of jobs with the RAF and the opportunity to use its facilities at its nearby air force base in Coningsby. The college will expand to take in 14-year-olds from September 2017 and – if successful – will be the forerunner of several similar initiatives between colleges and the RAF throughout the country. It will be one of 11 different career colleges – the brainchild of former Education Secretary Lord Baker – up and running around the country by the end of the year which specialise in training young people to work in a range of industries. The Air of Defence College is one of three being planned by the Lincoln College Group around the county – the other two will focus on construction and health and social care. Gary Headland, chief executive of the college, said: “We as a college group are always lookinf for innovation and we see this career college as a model which could be repricated elsewhere if successful. However, he stressed that it would not be compulsory for teenager committing to the college to go and work for the RAF. “Let me make it clear – this is not about recruiting child soldiers,” he said. The skills the students gained would stand them in good stead with employees – like the defence industry which has a number of major firms based in Lincoln. “Parents were keen on the idea of the soft skills that will be developed,” he added. These include communication skills, character building and the ability to work in teams – skills state schools are often criticised for neglecting. At first, the college will concentrate on three iey areas of recruitment: developing cyber space and information technology skills, vehicle engineer – with the opportunity to develop hands-on experience with aircraft at the RAF base and catering skills. As part of their work experience, they will spend 30 hours of work-related activity which will be linked to the defence industry. Careers opened up by the college courses include; mechanical engineering technician, vehicle engineering technician, avionics technician, hospitality specialist and a chef. Students already enrolled at the Lincoln Group of Colleges have warmly welcomed the plan for the career college. Ruth Gilbert, chief executive of the Career Colleges Trusty, said career colleges were now operating “from Yeovil to Northumberland”. However, she stressed: “None of these career colleges are linked to simply one employer. We’re not preparing them and setting them up so they can work with one employer.